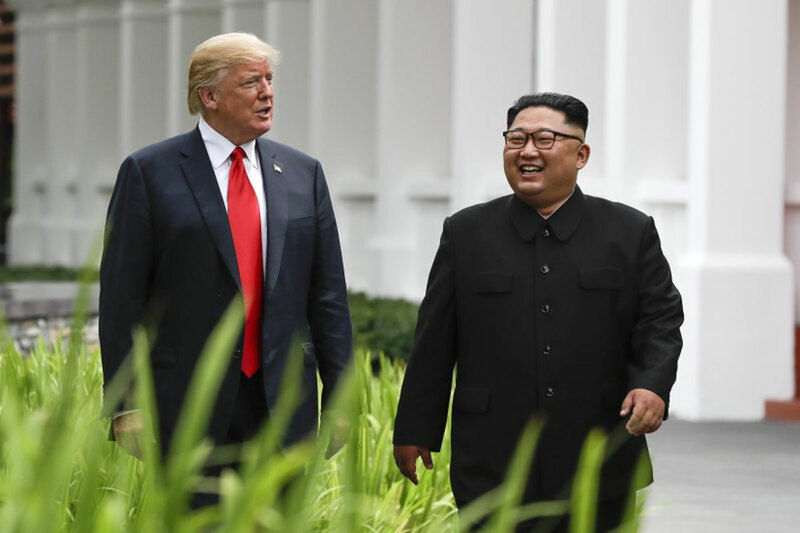 It was the greatest show on earth — at least for today and according to its main protagonists, President Donald Trump and North Korean leader Kim Jong Un. — After their aides joined for the working session following the first Trump-Kim one-on-one, Trump signaled that things had gone “better than anybody could have expected” and something would be signed soon. That something turned out be a document, with no details provided at the ceremony, which was the first concrete development in what had been a substance-free day until then. — What was new in that news conference: Trump said Washington would stop war games with Seoul. That’s of huge significance — the military drills infuriate Pyongyang who see them as rehearsals to topple the Kim dynasty. Trump said he ultimately wants to bring U.S. soldiers home from South Korea. There are nearly 30,000 stationed there. Trump also said Kim agreed to destroy a ‘major’ missile testing site, but offered no specifics. — Trump said the denuclearization process would be starting “very quickly;” the two developed “a very special bond;” and he “absolutely” would invite Kim to the White House. Kim ignored reporters’ shouted questions whether he would make that momentous journey, but Trump later said Kim had accepted the invitation. — Trump and Kim shook hands and exchanged farewells without interpreters as the summit ended. — So what happens next? Will Trump and Kim meet again — when, where and will it then be less of an event, not if it’s in Washington or Pyongyang — or will denuclearization prove to be too big a hurdle to circumvent? A three-way declaration also including South Korea on formally ending the 1950-53 Korean War might be the next most plausible and high-profile development. China would need to be present as well. 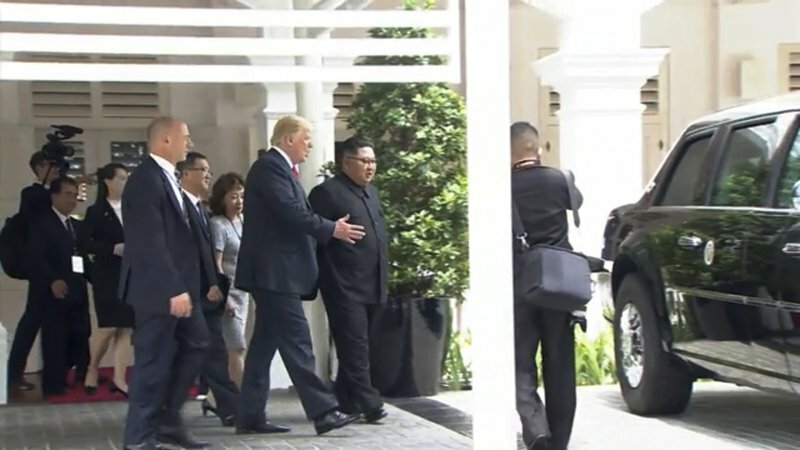 — Earlier at the day’s start, the choreographers and protocol teams did their work: both men emerged pretty much on cue, having left their respective hotels within minutes of each other, at the scheduled time of 9 a.m. from opposite porticos at the Capella Singapore hotel to engage in a first handshake timed at 13 seconds. It wasn’t on the battling alpha male Richter scale that characterized Trump and French President Emmanuel Macron’s’ first greeting, but it was hearty. Trump put his hand out first, Kim following his lead. Trump grasped Kim’s right arm, and then, later, took ahold of Kim’s left arm as they turned to face photographers whose cameras were producing a cacophony of shutter clicking as the soundtrack. 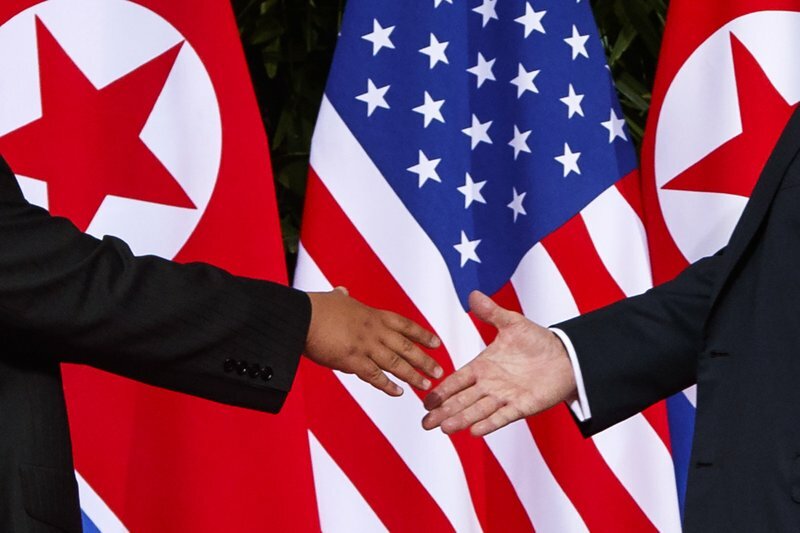 — Towering behind the two leaders’ grip and grin were a striking series of American and North Korean flags side by side on an equal footing, almost interlocked. It was a stunning piece of imagery for Korea watchers across the peninsula given the 70 years of North Korean iconography in which the U.S. standard was the flag of the devil. — In a bizarre moment, Trump showed Kim the interior of his presidential limousine, “The Beast,” as they strolled on the grounds after lunch. Kim was definitely smiling as he curiously peered in. — Sporting a red “Make America Great Again” baseball cap, Dennis Rodman, erstwhile participant on Trump’s “Celebrity Apprentice” and fleeting acquaintance of Kim, went full Reality TV show by copiously weeping during a live segment from Singapore with CNN. An emotional Rodman said he received a call from a White House staffer ahead of the summit to tell him the president was proud of him. He claimed he had “something to do with this North Korean situation” and also took a dig at Trump’s predecessor. President Barack Obama, he said, “just brushed me off” and “didn’t even give me the time of day” when Rodman returned from Pyongyang with a message from Kim after one of his trips there.